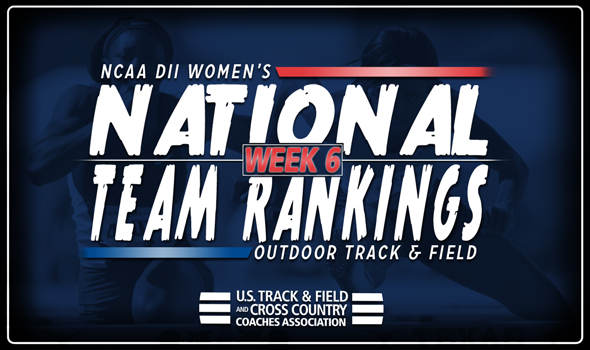 NEW ORLEANS – For the fifth-consecutive week, there is a new leader in the NCAA Division II Women’s Outdoor Track & Field National Team Rankings, announced the U.S. Track & Field and Cross Country Coaches Association (USTFCCCA) on Tuesday. Grand Valley State has taken over the top spot in the rankings, as the Lakers leap frogged West Texas A&M to rank first for the first time since the final week of the 2014 campaign. The Lakers split time between the GVSU Al Owens Classic and the Bryan Clay Invitational this past weekend, where the team totaled five top-10 NCAA Division II Descending Order List marks. Rachael Walters led the way for the Lakers, recording an Automatic Qualifying Mark in the 800 with a finish of 2:06.56 at the Bryan Clay Invitational. The Lakers’ 4×100 relay squad also ran a 46.01 at the Al Owens Classic, good for third on the NCAA Division II Descending Order List. Adams State saw one of the greatest jumps in recent memory, as the Grizzlies moved up a whopping 58 spots to fourth place on the week for the team’s first top-25 ranking of the season. The Grizzlies competed at the Beach Invitational, Bryan Clay Invitational and the Mt. SAC Relays over the weekend where the team collected six top-10 NCAA Division II Descending Order List marks. Kandace Thomas led the way for the Grizzlies with a wind-aided 11.44 in the 100 which was good for an NCAA Division II Automatic Qualifying Mark, as well as the lead in NCAA Division II on the season. Azusa Pacific also moved up five spots to fifth for its highest ranking since coming in at fifth during the fifth week of the 2015 season. The Cougars Nicole Warwick hit two NCAA Division II Automatic Qualifying Marks at the Bryan Clay Invitational, scoring 5,474 in the heptathlon and posting a 6.33m (20-9¼) in the long jump. Both marks lead the NCAA Division II this year. Rounding out the top-five was Angelo State, which managed to remain in third on the week. The bottom half of the top-10 did not fare as well as the top-half, as three teams dropped in the rankings, while two remained in their same spots from a week ago. Alaska Anchorage and Saint Augustine’s held onto sixth and eighth, respectively, in the rankings. Alaska Anchorage was paced by junior Caroline Kurgat, who notched the fourth-fastest 5000 time in NCAA Division II outdoor collegiate history with a mark of 15:43.95 at the Bryan Clay Invitational. Magaly Tshipopo kept Saint Augustine’s in the mix with the sixth-best high jump and ninth-best triple jump in NCAA Division II this year at the VSU Trojan Invite. But other than those two, the rest of the top-10 experienced a slight drop in the rankings. San Francisco State fell two spots to seventh, while Lincoln (Mo.) also dropped two spots to ninth. Pittsburg State saw the biggest fall, moving down six slots to 10th on the week.